Il Sibilo (The Whisper) is the title of a popular mid 19th century weekly Neapolitan journal, which served not only to report on the literary, musical and theatrical news of the day, as did many of its competitors, but also, as the name suggests, filled its pages with news of society scandals and gossip in and around Naples. 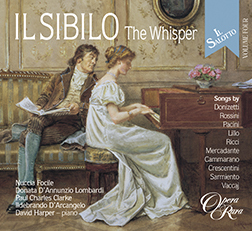 Il Sibilo (The Whisper) is the title of a popular mid 19th century weekly Neapolitan journal, which served not only to report on the literary, musical and theatrical news of the day, as did many of its competitors, but also, as the name suggests, filled its pages with news of society scandals and gossip in and around Naples. What also set the journal apart was that, on its back page it published, every second week, a short song. the songs represented most types of popular songs of the day, including romanzas, ariettas, barcarolas and songs in Neopolitan and Sicilian dialect and there were, in total, twenty six songs published. Chiefly composed by Donizetti and Pacini, the collection features guest appearances by Rossini, Mercadante, Giuseppe Lillo and Luigi Ricci alongside contributions from two Neapolitans, Sarmiento and Cammarano. 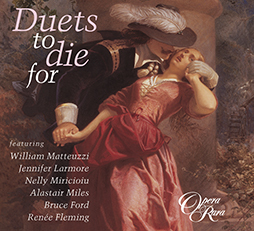 Six further songs and duets by Donizetti, Vaccaj and Ricci complete the recording, which ends with a celebration cantata by Pacini for the four soloists.